https://c1.staticflickr.com/1/914/41629697382_7cfec3c746_b.jpg https://c1.staticflickr.com/1/956/39862500370_fa3d0406de_b.jpg https://c1.staticflickr.com/1/938/41629697782_5fb8610e03_b.jpg https://c1.staticflickr.com/1/965/39862500820_79cf0f49a9_b.jpg https://c1.staticflickr.com/1/946/41629698092_8bed5c1fb0_b.jpg https://c1.staticflickr.com/1/946/27800616298_a7fbb83f7e_b.jpg https://c1.staticflickr.com/1/909/41629691292_ac576b450c_b.jpg https://c1.staticflickr.com/1/890/27800616598_3ecfc9461c_b.jpg https://c1.staticflickr.com/1/879/41629690722_bf77173d6c_b.jpg **Our original design. 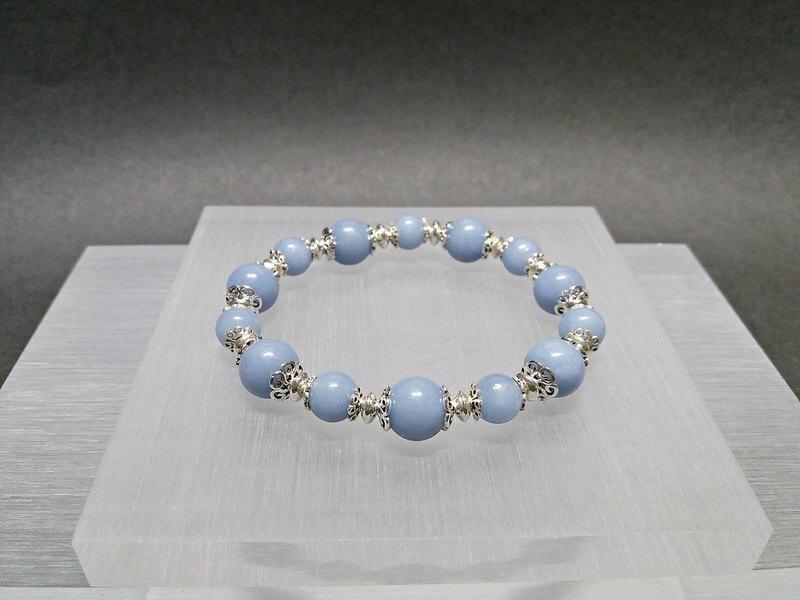 Do not copy in the same industry** **Natural Angel Stone Sterling Silver Bracelet** **Angelite Silver Bracelet** "Blue Sky" color: blue Hardness: 5 Origin: Dominica Material: Angel Stone, 925 Sterling Silver (International Standard Grade 925) Size: 10mm, 8mm (Spar is polished by hand, with a difference of +/- 0.2) **The shop uses natural spar and ore to ensure that it is 100% natural goods; if there is a fake, it can be repaid. ** **Angel stone** **Angelite** Angel Stone is a kind of spar that releases the energy of love and calm, with very high frequency fluctuations. It can help us understand that our own traits have their own functions; and we can accept ourselves to accept others, establish good interpersonal relationships, and enhance the harmony of love. In addition, Angel Stone can calm emotions such as anxiety, anger and fear, allowing you to maintain a calm judgment and bring new thinking. Not only that, Angel Stone has a powerful healing power, has a significant effect on the discomfort of the throat and trachea, and can prevent colds, lower blood pressure, relieve mood, and purify the blood. ^^^^^^^^^^^^^^^^^^^^^^^^^^^^^ **<Measurement method>** - Please use a soft ruler to wear a bracelet around your wrist. - No need to tighten or reserve space - Gently apply to your hand - Please use centimeters (cm) to measure accurately - Select the required length of the handcuffs when the amount is good - The length chosen is the length around the wrist The designer will reserve space for you. ^^^^^^^^^^^^^^^^^^^^^^^^^^^^^ **<Bracelet needs to know>** - Most of the photo of the bracelet in the field is customized with 16cm handcuffs. - Hand-painted model handcuffs are 14cm So there will be a sense of looseness, please forgive me. - Designers choose the length of the hand to modify the length **The crystal beads or silver ornaments picked up after the modification will not be sent back to you喔** If you want to keep the original design or want to modify it yourself Can order 16cm handcuff length Original design - There are silver bracelets that don’t look like the average bead. **Modifying a bracelet designer with silver will take the silver jewelry first** Preserving the crystal beads as a premise So friends who are too small (13cm or less) or too big (18cm or more) The modified style may be different from the photo Please contact the designer if you have special requirements. **Otherwise, the designer will modify it without notice. ** - Some styles are not suitable for too small (13cm or less) or too large (18cm or more) The handcuffs are too small or too big to design the original style So there is not too little or too much handcuffs on the selection of hand plaques. ^^^^^^^^^^^^^^^^^^^^^^^^^^^^^ **<Product Care>** - Pay silver cloth and moisture-proof bag - Brushed silver cloth can brighten sterling silver but silver cloth can't be washed with water - Pure silver can not be washed with silver wash water - Put it into a moisture-proof bag when it is not worn, it can be used for anti-oxidation - Take it when taking a bath and sleeping -**sterling silver can not be purified by water or salt water** - Please use a crystal cluster or amethyst hole to clean the spar without touching salt or water. - The spar must be purified to maintain the effect of spar energy - If the bracelet is damaged in the future, you can send it back for repair. ***paid return shipping** -**If sterling silver has been soaked in water or salt water** **Not refundable** <><><><><><><><><><><><><><> **<Send Notice>** **Sent to Hong Kong: -** ~ SF Express shipped ~ can be sent to the company, smart cabinet, SF station to pick up ~ Sending home will incur additional charges ^0^ ^0^ ^0^ ^0^ ^0^ **There are two ways to send to Taiwan:-** **1/ SF Express: -** ~ If there is no special requirement All sent by SF Express ~ Can be received from Hong Kong for approximately 2-4 days **In case of holiday** **Will delay the date of receipt** **please wait with patience** ~ Can be sent to home, company, store to shop (7-11, family, Lylefu, OK convenience store) # Please check if the store has a pick-up service first. ~ Please leave the <store code> and <name> of the convenience store **2/ Mailing registration: -** ~ All over the area are selected by mailing registration ~ Can be received from Hong Kong for approximately 5 - 8 working days **In case of holiday** **Will delay the date of receipt** **please wait with patience** ^0^ ^0^ ^0^ ^0^ ^0^ **Shipping time to Malaysia:-** 1/ Posting registration: - ~ Can be received from Hong Kong for approximately 7-10 working days **In case of holiday** **Holidays will delay the date of receipt** **please wait with patience** ^0^ ^0^ ^0^ ^0^ ^0^ **Other countries mailing time: -** - Please contact the designer to calculate the time OOOOOOOOOOOOOOOOOOOOOOOOOOOOOOOOOOOOOOOOO Founded in 2002, crystalplus has always been based on nature, paying attention to natural materials, carefully studying the characteristics of spar, and designing different accessories through the attitude of “finding, discovering, balancing and coordinating”, breaking through the usual customary design forms and techniques. And with the original different styles, incorporating the changes in modern life, convey a deeper level of design concepts. Our gemstone designer aqua has been working with spar for a long time, often exploring different spar interaction characteristics, and using different colors, changes in spar properties, and then matching each other; Science, science and aesthetics combine to create a layered and colorful design, and with the skillful craftsmanship, create a new design of jewelry.